what i remember: it was all running as it always did until i was using utorrent one night. it felt a bit sluggish and i read up on some BT clients so i decided to replace utorrent with qbittorrent. problem persisted and i noticed that the hdd indicator light always stayed on and the task manager always showed that there's some disk activity going on. to test things out, i tried copying files to and from the hdd to a bunch of usb 3.0 devices. from the hdd to a usb3 external hdd, transfer rates would only be around 1MB/sec to 6MB/sec at most. tried usb3 to usb3 transfer (ext hdd to flash drive and vice versa) and the speeds were alright. tried going for the most conservative settings on the lappy (basic mode) and it still performed the same. editing a photo in LR4 takes about 2~5mins just to apply a preset and expert a jpg file. i went for the win10 upgrade to see if there's any difference and it's still the same. 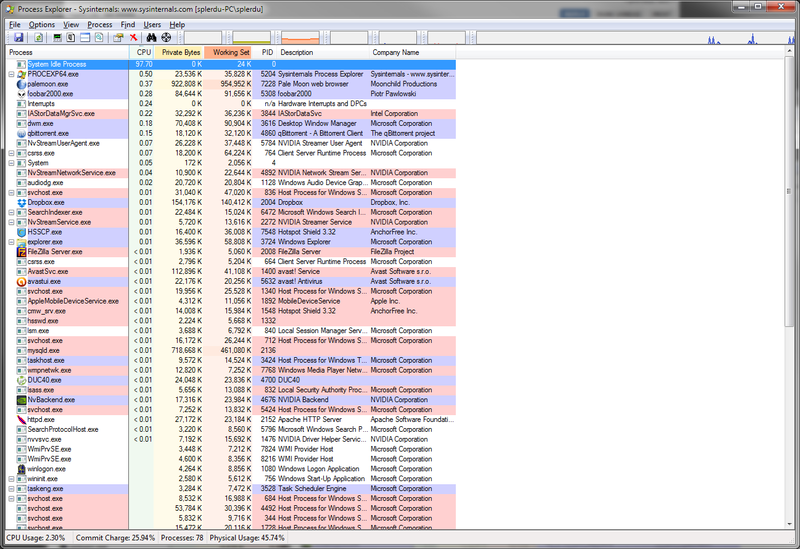 slow pc performance (even browsing on the pc is slower than an android device) and there's still a lot of hdd activity going on. i'm close to reformatting the pc but i'm willing to try and solve things first. if anyone has some ideas or is even willing to look at the computer, i'd be more than willing to cooperate. TIA! just to add, tried malwarebytes and it didn't see anything. 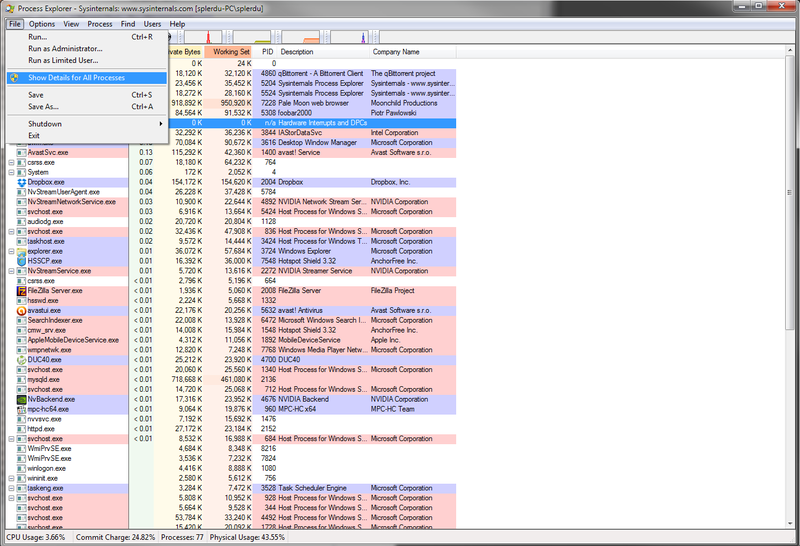 currently running a full scan with windows defender. and every now and then, i'd get a notification at startup saying the system needs to restart make sure all drivers are installed... but this problem only came out after all the things mentioned above. 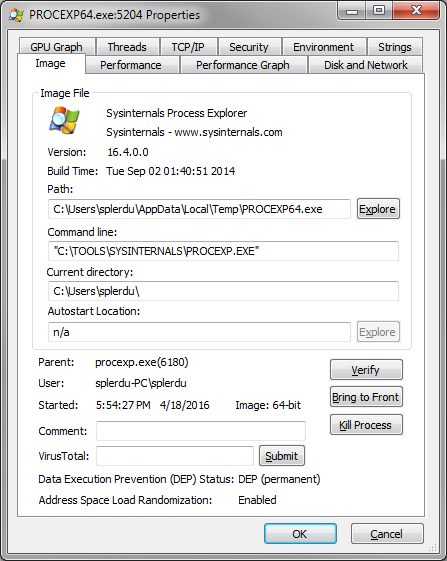 Get Process Explorer from the Sysinternals Suite. Click on "Show All Processes" (this displays stuff that might be hidden as system, or running as a different user account). You can also do this according to disk or network activity, depending on what you're investigating. Right click the column list and go to "select columns". You'll get a tabbed list of stuff you can display. Right click your suspicious process and go to properties. The "Image" tab will show you where the file is located. You should be able to find anything you didn't install yourself from here and clean up manually. 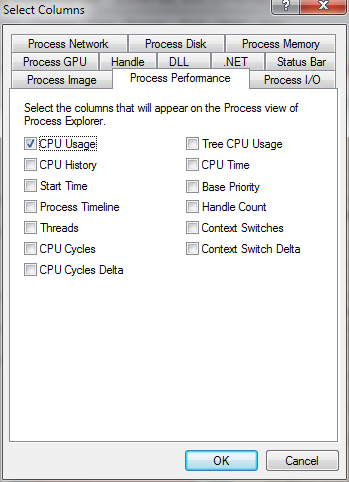 If unsure, just start killing processes one by one until the computer speeds back up. Once it speeds up you've most likely found your badware. dying HD perhaps? download hd_tune to check S.M.A.R.T. data. Hahahaha somehow Dean that reminded me of something from circa 2001.
fresh install + SSD solved it LOL so it could really have been a dying hdd. I'm experiencing slow downs, as well. my system drive randomly experiences 100% activity even if I'm only doing light work.